My first suggestion to this is just to close your eyes. Really. And think about the sensations about, say, winter squash wontons. Think about the toppings that will go with it—soy sauce, maybe some sesame oil and fresh garnish like hot chili peppers. Sweet, orange squash inside a noodle wrapper, drizzled with these toppings… does it taste good in your imagination? The second key is to try to think of a bridge. Something similar to this that you’ve had, and can attest through experience tastes good. 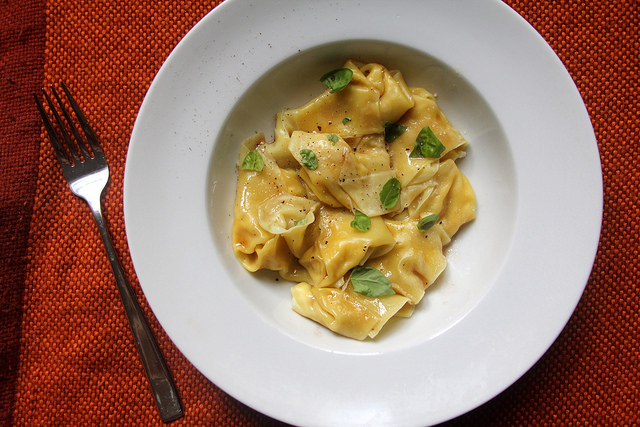 And then it comes—in sweet and savory, winter squash or pumpkin-filled ravioli. So my next suggestion when making something new that you don’t know how will turn out is to make something simultaneously that you know will. This can be a dinner-saver; and it has worked to my advantage in many incidents, such as the time that I learned the hard way not to substitute tofu for beef in bolognese sauce. Ideally, this dual dish will be something that doesn’t expend a lot more of your energy, as it can be done in the same strokes as the experiment—you just need to buy a few more ingredients. So I set out to make, at the same time, a winter squash puree-filled ravioli (to serve with some brown butter and fresh herbs) and winter squash wontons (served with toppings like soy sauce and chili oil). 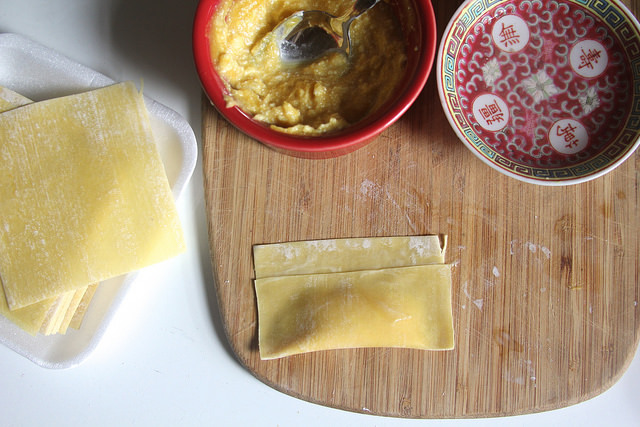 Wonton wrappers are essentially the same thing as homemade pasta: an egg-and-flour dough, pressed into flat sheets. 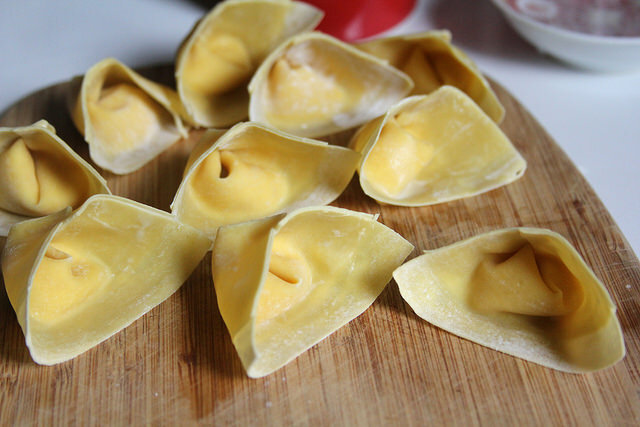 Wonton wrappers are also square, so when you’re substituting them for rolling out your own homemade pasta dough, they can either be stuck together for one big, huge square ravioli, or cut out into shapes like round ones. Or folded into triangles. Or—heck, just twisted into pointy, classic wonton shapes. They almost resemble tortellini, or some other dumpling-like Italian pasta. So I just went with that. The winter squash is a variable thing, but most of them feature a dense, yellow-orange flesh that must be cooked a long time. After breaking one apart, scooping out the seeds and roasting the flesh cut side-down on in the oven, the squash acquiesces to custardlike softness. This stuff is pure culinary gold. Treasure it, use it, freeze it, and use it again. A soup is just the beginning of what it can become. I had roasted a couple of acorn squashes, a thick-skinned, smallish winter squash with a round, ridged shape, and incredibly tasty, orange flesh once cooked through. After scraping this stuff out of the skins and smoothening it with a stick blender, it was minimally seasoned, to best taste the squash. The ravioli version got a bit of ricotta, while the wonton version went without. 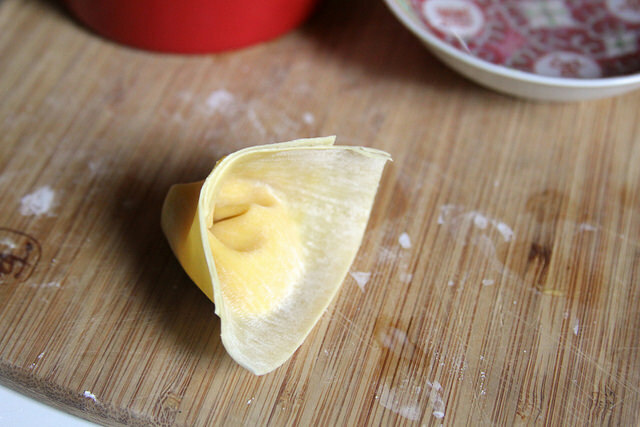 Using store-bought wonton wrappers are a quick fix especially if you don’t have a pasta crank; rolling out the sheets of homemade, kneaded pasta dough to a very thin, even layer is quite a task (although pretty fun, especially if you have people around to help out). 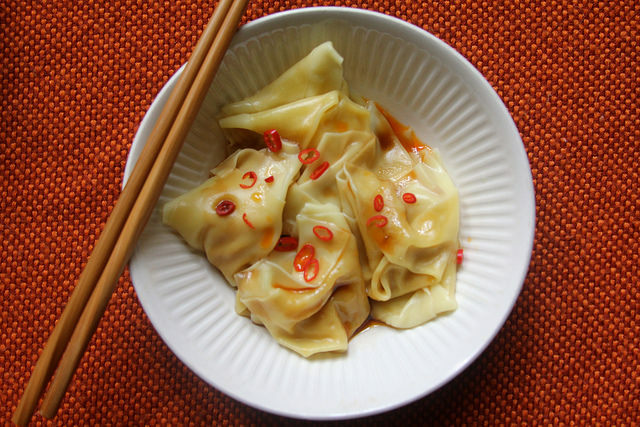 It makes the job so much faster with the square wonton wrappers—just don’t substitute them with white, round dumpling skins, as those are made for dumplings, and don’t have egg. Both versions were boiled just a few minutes until the noodle wrappers were cooked through. Then, the wonton version was drizzled with some soy sauce, hot chili oil, and a sprinkle of fresh hot pepper (use a bit of scallions or cilantro instead if you don’t like it hot, and just sesame oil alternately). The ravioli version got a slick of brown butter (butter sizzled in a hot pan until just chestnut brown), and basil. Add some sage and shredded cheese like parmiggiano-reggiano to the top if you like! Fortunately, neither version was a disaster. And I can’t even decide which one I like better. Try each (perhaps on different nights, rather than in alternating bites) to decide on your own! Preheat oven to 400 degrees. Slice the squash in half. Scrape out the seeds and stringy bits of the center. Coat the squash with the olive oil, and place cut sides-down on a roasting pan. Place in the oven and cook for about 30 minutes, then check on the squash. Touch the top and if it feels soft, remove from oven (cooking time depends on size and shape of the squash, if it still feels hard to the touch, keep in a bit longer). 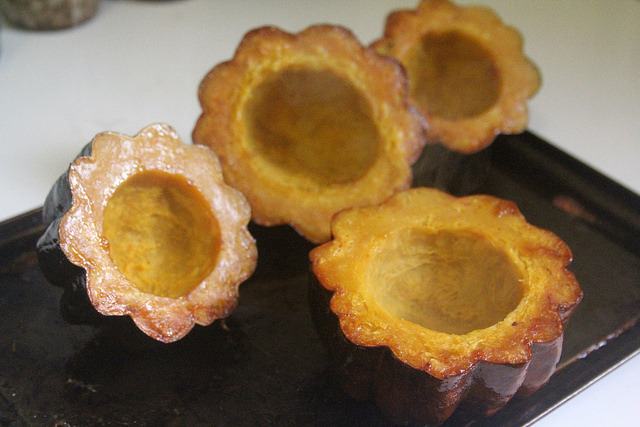 Turn squash halves over to cool several minutes. Once cool enough to handle, scrape out the orange flesh from the skins; discard skins. Transfer to a bowl or pot and mix with about ½ cup of water (or milk) and blend thoroughly with a stick blender. Add a couple pinches of salt and pepper to taste. Separate the squash puree into two bowls; about 1/3 in one bowl and 2/3 in the other. 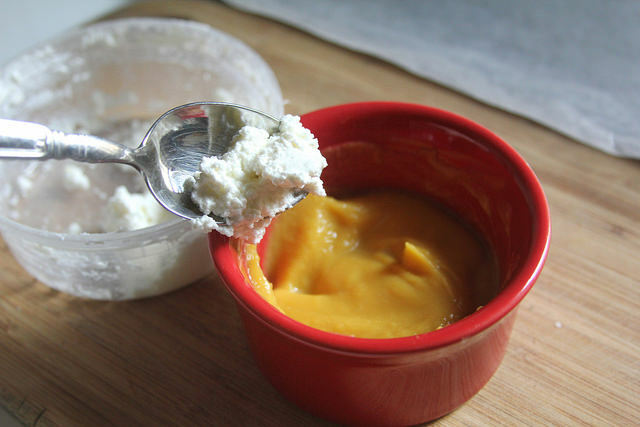 Mix the ricotta into the bowl with 1/3 of the squash puree. To make the wontons, place a small scoop (a little smaller than a teaspoon) of the filling on a wonton skin, a little toward the bottom. Dip your finger into a small bowl of water and trace along the sides of the square, and a horizontal line about ½” down from the top edge. Fold the bottom half of the wonton over the filling and seal onto the line of water. There should still be a ½” of single-layer wrapper above the filling fold. Now, flip it over, and dab water on one bottom corner. Take both bottom corners and seal them together tightly at just the pointy edges. This is now a wonton. Place it on parchment or waxed paper. Continue procedure with the rest of the squash filling. Then, move on to the squash-ricotta filling, and repeat procedure (making sure to separate your finished wontons so you can tell them apart!). Bring a pot of water to boil and boil each batch separately. The wontons should be boiling in rapidly boiling water about 3-5 minutes or until the wrappers look translucent rather than opaque. Drain. For the wontons without ricotta, serve in a bowl with the soy sauce, chili or sesame oil, and fresh garnish like sliced chilies, scallions and/or cilantro. For the ravioli versions with ricotta, place in a serving dish. Heat a small pan and add 1 tablespoon of butter. Swirl in the pan until it’s bubbling; once it turns a golden, chestnut-brown color, remove from heat and pour over the ravioli. Serve with fresh herbs like basil or parsley. Alternately, sturdier fresh herbs like sage or rosemary can be added to the pan while the butter is browning. Three brownie points: Simple and healthful. The bare-bones filling of just purely winter squash is chock full of Vitamin C and antioxidants to keep you fighting off winter colds. 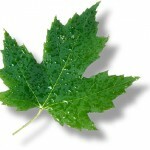 It has natural sugars, too, but that just means you don’t need much to season them with. Consider putting this puree into more surprising juxtapositions throughout the cold season. 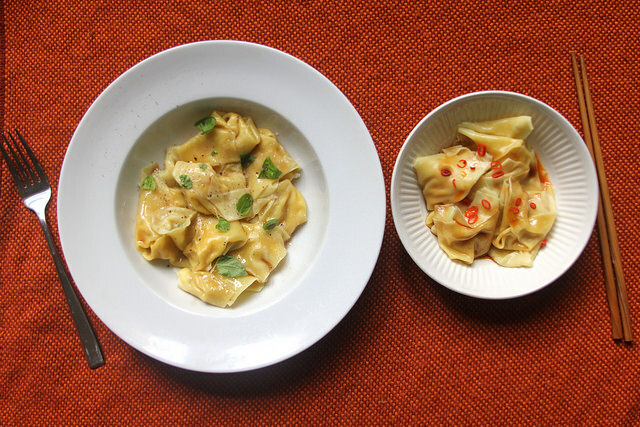 Seven maple leaves: You don’t need to have tons of ingredients to make wontons, or ravioli. And you don’t even need meat! These vegetarian versions of some classic comfort foods are a nice change of pace that’s healthful and low-impact for the environment. 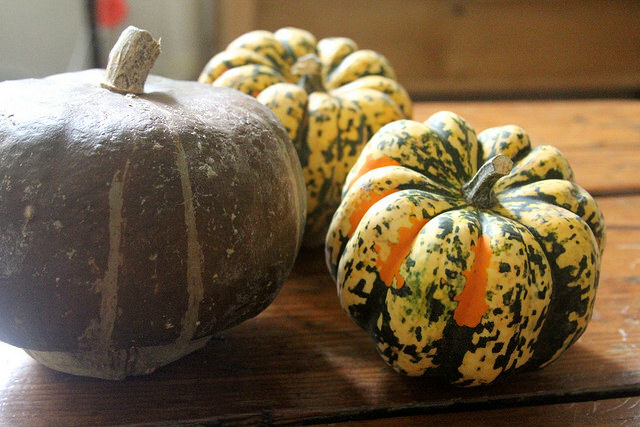 Plus it’s a great way to use up some leftover squash you might have—perhaps those you used as decorations this fall. This dish is looking very awesome and I want to try this dish hope I could make it someday. Thanks for sharing this. Let me tell you that winter squash is one of the favorite food and it is delicious no doubt. This is so awesome! 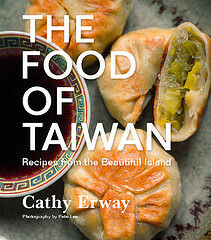 Gonna try this wonton this weekend. I can’t wait.